Join us for a variety of weekly events held in the Crested Butte area throughout the fall. Shows one hundred films at multiple locations and brings the best of international documentary, narrative, outdoor adventure and short films home to Crested Butte - in addition to thirty visiting filmmakers and actors. There are multiple types of tickets to suit the needs of any kind of film lover. For more information, passes and tickets visit the website. The Elk Run 5k is a premier event founded by Olympian Emma Coburn with the intention to attract runners of all abilities throughout the state and to encourage health and fitness. 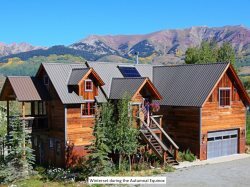 The race will take place in Emma`s hometown, beautiful Crested Butte, CO on September 29, 2018. Emma Coburn is an American middle distance runner who specializes in the 3000 meter steeplechase. She set an American Record of 9:07.63 in the 3000-meter steeplechase to win a bronze medal at the 2016 Olympic Games. In doing so, she became the first American woman to win an Olympic medal in the event. Emma is a 5x US Champion and was a multiple time NCAA champion while at the University of Colorado. Born in Boulder, CO and raised in Crested Butte, Emma hopes to give back to the small town that his given her so much. Join us for the 2nd Annual gO Turkey Trot benefiting the GO Initiative. The holidays can be a tough time for a lot of us; the mission behind this particular race is to raise awareness for mental & physical health in the Gunnison valley. The holidays can be a tough time for a lot of us; the mission behind this particular race is to raise awareness for mental & physical health in the Gunnison valley.